This quilt design has been in the works for a long time. I designed the appliqué blocks several years ago and was motivated to finish the design of the quilt because several of my Beginning Quilting students requested a class on appliqué. So, here it is... an appliqué garden with mix and match fantasy flowers. 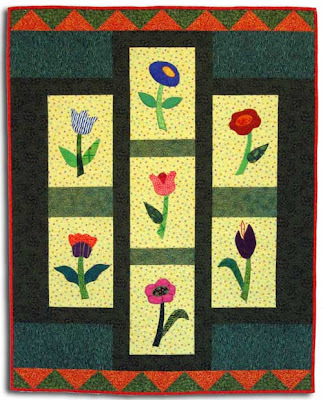 I'll be teaching this class, "How does your Appliqué Garden grow?" on September 19 and again on October 25 at Chattanooga Sewing. The technique I use can be done by hand or by machine. The flowers are detailed with a bit of hand embroidery as I like the mix of hand and machine stitching. I tested Superior Threads new So Fine #30 (formerly Brytes) polyester thread on this quilt. It appears mostly in the borders as a background fill. I was curious about this thread's performance so I used a color that blended with the fabrics. This thread comes in 50 solid colors. I got a small selection of colors and took advantage of the introductory sale price (which I think goes through the end of this month, if you're interested). I used a 90/14 quilting needle (Superior recommends #100/16 topstitch) and Bottom Line in the bobbin. The threads worked like a champ. I'll be looking for a future project on which to use this thread as more of a focal point to really let it sing. 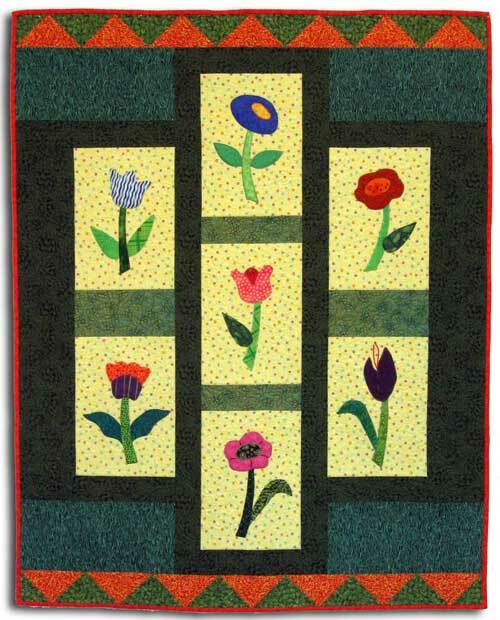 If you want to give appliqué a try, join me in class and see how your applique garden grows.